In need of something different. Lauren is now a Loving Mama, part time Kids' Yoga Instructor, and, of course, an entrepreneur. Delia is a sweet (almost) 5 year old who loves to play Yoga, roast marshmallows, & jump in water, no matter the temperature. Dharma is a 1968 Aristocrat Lo-Liner camper trailer with a wonderful sense of adventure. 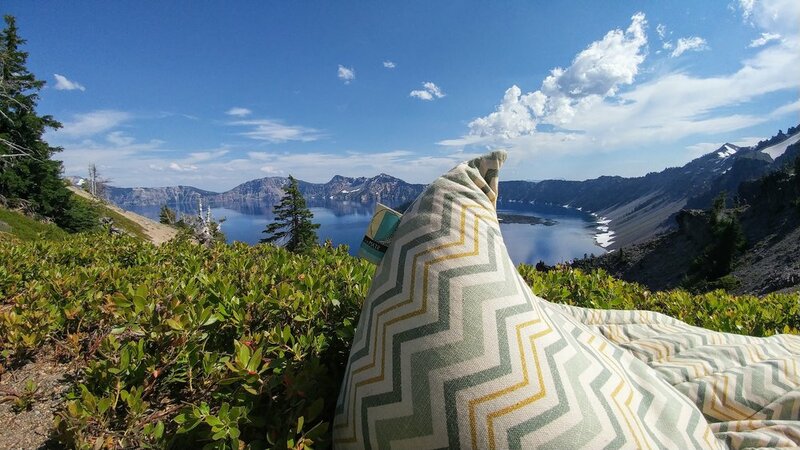 When we first embarked on our cushion creating path in December of 2012, we were simply trying to make a better meditation cushion than those we had seen and used. Lauren had a low back injury that made it challenging to sit for very long, and the regular zafus just weren't supportive enough. We approached Lauren's father, Michael, about the idea and he, being the brilliant problem solver he is, came up with some prototypes (although, they did look pretty potato like to start with!). We then set out to combine our own experiences with the expertise of those around us (chiropractors, healers, etc.) to design and shape a unique, simple, functional cushion for meditation. It wasn't long, however, before the people we were selling our cushions to - and we ourselves - began using them for all kinds of other things. Picnics and parties, meals around the coffee table, drum circles, roasting marshmallows around the campfire, folding laundry, lounging reclined to read a book, making art, playing games, and connecting with kiddos (we even used it for a cushy spot for changing diapers! ), are just a few ways that have been discovered so far to use a MATR cushion! We dicovered we were on to something, and have since fallen in love with living and manifesting new ideas, and coming up with innovative, ergonomic, fun new products. We invite you to join us in Manifesting. We invite you to get comfortable and try our thoughful designs. We invite you to MATR, and get re-connected to what matters - whether it's story-time on the floor with your kids, a meal with friends around the coffee table, or simply sitting in peaceful silence. We think it matters to have mindful practices (in life and business). That's why we lovingly and consciously design, source, and handmake each one of our products. Join our family. Get comfy. Sit supported. And MATR !